Citation Information: J Clin Invest. 2006;116(5):1337-1345. https://doi.org/10.1172/JCI27400. Focal segmental glomerulosclerosis (FSGS) is the most common primary glomerular diagnosis resulting in end-stage renal disease. Defects in several podocyte proteins have been implicated in the etiology of FSGS, including podocin, α-actinin–4, CD2-associated protein (CD2AP), and TRPC6. Despite our growing understanding of genes involved in the pathogenesis of focal segmental sclerosis, the vast majority of patients with this disease, even those with a familial linkage, lack a clear genetic diagnosis. Here, we tested whether combinations of genetic heterozygosity (bigenic heterozygosity) that alone do not result in clinical kidney disease could function together to enhance susceptibility to glomerular damage and FSGS. Combinations of Cd2ap heterozygosity and heterozygosity of either synaptopodin (Synpo) or Fyn proto-oncogene (Fyn) but not kin of IRRE like 1 (Neph1) resulted in spontaneous proteinuria and in FSGS-like glomerular damage. These genetic interactions were also reflected at a functional level, as we found that CD2AP associates with Fyn and Synpo but not with Neph1. This demonstrates that bigenic heterozygosity can lead to FSGS and suggests that combined mutations in 2 or multiple podocyte genes may be a common etiology for glomerular disease. 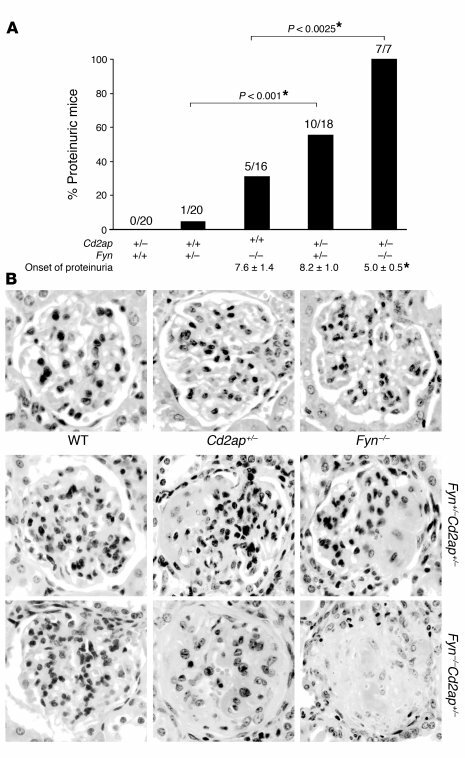 CD2AP haploinsufficiency enhances proteinuria in Fyn-deficient mice. (A) Mice were tested monthly for proteinuria. The incidence of proteinuria is depicted as both percentages and absolute numbers for the indicated mouse genotypes followed to up to 12 months of age. The onset of proteinuria is shown below for each genotype in months ± SEM. *Statistical significance. (B) Sections of formalin-fixed kidney cortex from 5- to 8-month-old mice were stained with H&E and with PAS. In Fyn–/– mice, most glomeruli were normal (top right). Representative glomeruli from Fyn+/–Cd2ap+/– mice (middle row) or Fyn–/–Cd2ap+/– mice (bottom row) taken 2 months after the onset of proteinuria reveal mesangial hypercellularity and segmental sclerosis or global sclerosis in some glomeruli. Magnification, ×400.